← What’s in Yo’ Bag? I tweeted a link to the article because several of my connections on Twitter are involved in studying the uses of social media for marketing and advertising. The people who run the Domino’s account on Twitter saw my mention of them and asked me to follow them, so I did as I was curious to see how they were using Twitter. They also were kind enough to send me a coupon for a free pizza so I could try the new pizza myself. First of all, I will put it out there that it’s almost blasphemous that I’m reviewing Domino’s pizza here. I live in NYC, specifically in Brooklyn, which is known the world over for having amazing pizza provided by locally owned establishments. My favorites for whole pies are Lucali in Brooklyn and Two Boots in Manhattan. By the slice, my favorite place is a hole-in-the-wall joint near my office on W. 40th St. called Siena’s. But every few weeks, my boss will order up a few pizzas from Domino’s for the office for people working late because there is one nearby. I figured I should see if the pizza was markedly improved since I do find it on my list of food options every so often. Also, a lot of my friends don’t live in a city with a lot of options when it comes to pizza but almost all of them have access to Domino’s. I thought they’d appreciate it if I tested it out for them. So I ordered up a pie last night with pepperoni. After doing a little research, I saw that Domino’s truly made a commitment to rebuilding their pizza formula. Everything is new – new crust, sauce and cheese blend. The impetus behind the pizza makeover? 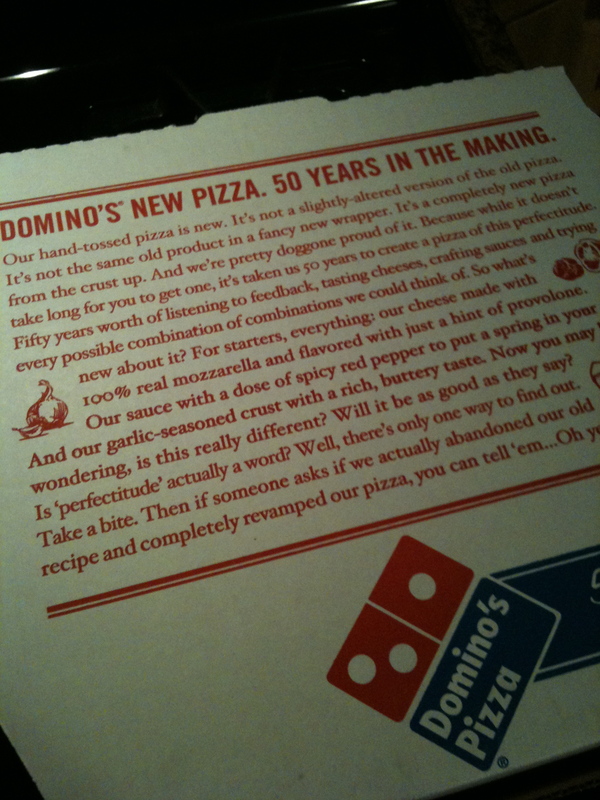 2010 marks Domino’s 50th year in business. I also think the nightmare earlier this year in 2009 with the gross video of their employees on YouTube (I’ll spare you the link) probably drove them to think of innovative ways to improve their image and their market share. For starters, I never thought the “old” pizza was horrible. I’m very picky about pizza sauce and I always thought their sauce was fine. Based on the what the box was promising, I prepared myself for more cheesy, more spicy, more garlicky and then dove in. I had two slices to make sure I really got my tongue around what was going on there. Verdict: The new pizza was good. Not amazing or a revelation, but good. It’s an improvement. I felt the biggest difference was in the crust. It is markedly more flavorful. Actually, it was almost TOO flavorful for my taste. I prefer thin crust anyway, so I wouldn’t typically be eating this style of pizza from them. The crust was soft and chewy and very garlicky and buttery. If you like saving all the crusts for last and dipping them in sauce, then this may be your perfect pizza. Regarding the sauce, it is still good. I can’t remember the flavor of the old sauce well enough to say whether this new sauce is much spicier, but I still like it. And as for the cheese blend, it does taste a bit more flavorful. I think the old pizza’s cheese was bland, but it was usually covered in a mix of veggies, so it wasn’t as prominent a part of the taste for me when I ate Domino’s. But here on the pepperoni pie, the more flavorful cheese was noticeable and appreciated. So, there you have it. The new pizza is a better pizza and if you enjoyed Domino’s before, you will most likely like this one. If you didn’t like Domino’s before, I think you should give it another try and see if you like it now. Unless you live in NYC. If you live in NYC, I think you should go support your family-owned shops and get a real New York slice. 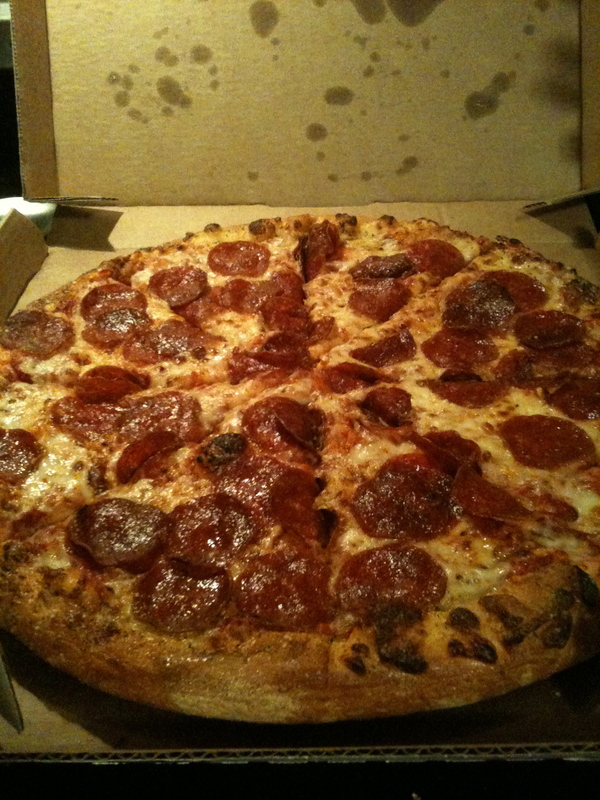 Thanks to Domino’s for the opportunity to try the new pizza for free. I appreciate your efforts to use social media to reach out to people and let them know what you’re up to!! So, what are your thoughts on pizza? Where is your favorite place for a slice or a pie? How many times do you order pizza for delivery. Leave me a comment and say hi! The Pizza Turnaround – Domino’s website with info on their new recipe and a display of live tweets on what people are saying about them. This entry was posted in Eating or Cooking, Social Media and tagged advertising, dominos, food, marketing, nyc, pizza, socialmedia, sponsored. Bookmark the permalink. I logged into Dominos site a few days back (its the only locally to get a buffalo chicken at 1:am) and they were pimpin the new pie. I tried to order it, but couldn’t. I suspect that either its not rolled out, or not available at all stores. Still, my fave joint is DiFara’s. A slice/pie is expensive as hell, but its like sweet Italian manna. San Remo on Coretlyou is pretty freaking righteous, too. You know, I haven’t tried DiFara’s yet but I really want to. I think the new pizza is supposed to be available everywhere now, so keep checking back. I’ll have to see if I can get down with San remo next time I’m over at friends’ in that neighborhood. Thanks for the comment, Jeffrey! Checking back with Dominos is one of the reasons why I’m looking to drop 15 by the end of March. Thanks, Sarah! If you click the link from Domino’s at the bottom, they made a YouTube video about how their employees reacted to negative feedback on Twitter and elsewhere and how they worked on their new formula. I think sometime we forget that some of these huge corporations have real people behind them that truly care about what their customers think and want their products to be awesome. If anything, I am more connected to Domino’s now BECAUSE of their efforts and outreach. They’ve put themselves on the Companies Who Care list as far as I’m concerned. Emily, I actually saw the video last week and was very impressed. It’s refreshing to see that companies are listening and not just broadcasting their message in this online world. If anything, I’ll give their pizza a try, because I appreciate their efforts to connect with their customer base. Thanks again for the post! I had nothing at home to make for last night and found a Domino’s pizza and also tried out the new pizza. I agree on all points. With a couple additions: The pizza looked appetizing. the last time I had Domino’s I remember it looking pretty unpleasing to the eye and I opened the box not only did it smell delicious but it looked edible. I also noticed that the new crust only applies to the hand tossed and not the other options (deep dish, thin, brooklyn style(ahem really). My favorite NY pizza was this crack pizza from Lenny and John’s on Flatbush then they changed their recipe and it went from delicious to a’ight. Favorite pizza over all is Monte Carlo Pizza at home in Harrisburg, always delicious hot and fresh ingredients. I was disappointed that I couldn’t get their new crust in think crust form as well. I’m glad you tried the new pizza and felt my review was on target. Love “crack pizza.” Heee heee hee. Thanks for the comment, K! Vivaldi’s in the Berkshires sounds awesome, Peter! I really think there is something about going in to support the moms and pops that’s special. The atmosphere of a Domino’s just screams chain and doesn’t make itself feel like a place where you can go connect and really build a relationship with the people making your food. That said, if you see my reply to Sarah’s comment, I do think they are making more of an effort to connect with their customers and this is a nice (and big) first step. Great post, Em. It’s good to know that not only is Domino’s listening but that they’ve upped their game. There is a Domino’s a few blocks from where I am in Dumont. I’ll have to try the new recipe before I move into the city in 2010. I like this NYT interactive map of “Where The Pies Are” and I can personally vouch for 2 of the Patsy’s locations (Harlem & UWS) for thin crust. If you ever make it to Minneapolis, you must try Punch Pizza. It may be the last Domino’s you eat since you are heading to the home of the best pizza in the country. Thanks so much for the comment, Clay. I’ve been to a few spots on the NYT map and look forward to checking out a few more. Can’t wait ’til you get here! Thanks for reaching out via Twitter and also thanks for the congrats. It would be nice if it could be that way, but I doubt their business model would not be going in that direction any time soon. Growing up in South Jersey, the pizza shop is where we hung out as kids and made life-long relationships. This is whole other topic, but it got me reminiscing…something Domino’s could never achieve with their layout. In terms their social media campaign, I’ve been somewhat impressed but find it hard to believe they are not in the engagement phase. You took the time to write this detailed, entertaining post and they don’t have the time to write a thank you comment and show some appreciation? You and I both tried their pizza because of their social media campaign and wrote about it, however I doubt either one of us will go out of our way to buy their pizza again. Not necessarily because of the lack of engagement, but that could always help us keep mentioning them. Thanks for the great comment, Michael! Yeah, you have to cut me some slack . . . I reviewed it for the social media aspect and for all of my friends where I’m from (New Hampshire) that don’t have access to NYC Pizza! That said, Domino’s *did* thank me for my review on Twitter, both publicly and via direct message. Also, if you look on their pizza turnaround site, you can see they feature certain tweets with the #newpizza tag. My tweet with the link to my review was up on that site for several hours, which I appreciated. I think Domino’s is just learning how to behave as a socially engaged group. “Turnaround” is an accurate term, as they’re trying to educate and mobilize a group of executives for whom social engagement (at least online) is not second nature. I do not ever think their physical locations will be the places that make people feel warm and fuzzy. But I believe it’s possible for them to leverage social media to make their customers feel loved, just like Zappos.com does (How many Zappos.com customers have ever been to their Nevada headquarters?). Again, thanks for the comment. Really appreciate it, and so nice to meet you. I apologize Domino’s!!! That is great to hear. They left me hanging after asking for my opinion. I let them know what I though and heard nothing back…yet. It may not have been a glowing 140 character review, but I tried their pizza and told them what I thought. Crickets so far. It may be against corporate policy to comment on blogs, but I personally would like to see it. It gives the company more personality and less of that corporate feel, in my opinion. Especially, if the commenter has some character. Great post. I think Domino’s is doing great job with this new pizza from the social media to the outright honesty in their marketing. And, indeed their pizza is better. I had to try it for myself and I agree with you that the crust is the biggest difference. It went from really cornmeal-ly and dry to super buttery and garlic-infused. Like you said, maybe a bit too much but I enjoyed it. Btw, Two Boots is amazing. But when I lived in NYC, the best pizza was Stromboli Pizza in the East Village on 1st. and St. Marks. They have amazing Sicilian slices!